Our family loves caramel. Whether it's in a coffee drink, on ice cream, in brownies or cookies or just eaten in one big bite off a spoon. But caramel is mostly sugar... and I don't like that. I previously have blogged about my failed attempts at a sugar free caramel. I can tell you 100% it depends on the sugar substitute you use! After frustratingly failed attempts using my regular brands of Xylitol and Eyrthritol, I tried it with Just Like Sugar (table top version) and it worked. Worked beautifully and perfectly. I made 2 batches (see how excited I was?) using one in the Salted Nut Candy Bars I posted below this, and I have the rest in a recycled Smuckers jar in the refrigerator where it's slowly but surely disappearing before I'll ever get a chance to use it in any more recipes. It's just so good you can't help but take a big spoonful. Have everything measured out, ready to go, because once you start to make this, you don't want to walk away from the stove and let it burn. Heat butter in a heavy bottomed pan on the stovetop over high. Just as soon as it starts to sizzle and boil, watch for it to start turning golden brown. Immediately add the Just Like Sugar and cream to the pan, whisking quickly. Still whisking, sprinkle lightly the xanthan gum and whisk like crazy so it doesn't clump. If you want your caramel sauce thinner, leave it out completely. This is simply a thickener - which makes it easier for me to use in my candy but for brownies, ice cream, etc. you won't need it. After only a minute or so, your caramel should now be a rich color and nice and thick and beautiful. Remove from heat and whisk or stir in the vanilla. Store in a glass jar - let cool on the counter and then put the lid on and store in the refrigerator. So buttery and rich! And yet... no sugar! Regular readers will remember when I made sugar free Salted Nut Rolls - what a huge hit those were around our house! The ability to eat a 'candy bar' but it wasn't bad for you. At the time of that post (here) I mentioned how important the brand name of the exact products was to the outcome of the recipe. I had to resort to using a Smucker's Caramel sauce because no matter what I did, I could not get my homemade sugar free caramel to work. I suspected at the time it was because I was using Xylitol, and even though 'supposedly' it could get to amber caramel stage, I will tell you this is not so. Not with the brand I had anyway. It was so hot it was almost smoking and nothing, I mean, nothing was going to make it turn amber. I tried that twice. I also tried with Erythritol. No dice. This time, I had purchased Just Like Sugar Table Top Sweetener in addition to the Splenda, Erythritol, Xylitol and other sweeteners I had on hand. I just had a feeling that the Just Like Sugar might work. The problem of the day? My nougat layer wouldn't set up! It was a high humidity day, which probably affected it, but I also used different version and/or brands than I used the last time on my Salted Nut Rolls and boy, was there a difference. So... my Salted Nut Roll turned into "Salted Nut Candy Bars" and I'm keeping them in the refrigerator and/or freezer since the nougat was so persnickety this time. In a saucepan melt the butter and add the xylitol, stir until disolved and clear. Add the erythritol, stir until dissolved then add whey protein. Cook for about 2 minutes, remove from heat and beat in cream cheese and flavorings. Let cool. Wrap in plastic wrap and refrigerate until chilled. It should be like playdoh - so you can work it into a shape with your hands. *NOTE* This is the version that works perfectly. I went off the beaten path and used unflavored Nature's Best Isopure Zero Carb whey powder and Just Like Sugar instead of the vanilla whey powder and Erythritol and the result was a nougat that was nothing like the soft dough. It was very runny. I saved it by adding a bit more cream cheese and 3/4 c powdered Erythritol and then melted a package of sugar free marshmallows and beating that in (Marshmallows Sugar/Gluten Free ). In a 9 or 10" square pan, place a layer of aluminum foil. Melt the chocolate chips in the microwave and pour onto the aluminum foil and spread with a rubber spatula. Place this into the refrigerator while you get the other items ready or just chill until it's set a bit - it doesn't have to be rock hard, just not completely melted. Add your layer of nougat and spread or press over the chocolate. Now pour your caramel layer over the nougat and after a brief few minutes in the freezer or refrigerator to let the caramel just set up a tad, sprinkle nuts over the top of all. Chill until set and cut. You can make this more of a 'candy bar' by melting another package of chocolate chips and dipping each sliced bar into the chocolate and let stand on parchment or foil until hard. I don't personally like chocolate very much so I didn't dip ours. Once in a while you run across a simple recipe you just feel compelled to try, even if you have your doubts. This is one of them. When I saw this recipe there were no photos, few instructions. But... just a couple ingredients? Too easy not to try. I don't often have saltines in the house, but it just so happens, I bought some a week ago to accompany the homemade tomato basil soup we had. With bacon and crackers readily available, it was a good 'test' during lunch today. Wrap a half bacon slice around a saltine cracker. Place on a baking sheet, sprinkle with a bit of brown sugar and bake at 350 for 25 minutes until done. For my test I used 10 small square crackers, 5 slices of bacon cut in half and I opted to forgo the brown sugar as I don't like to eat sugar needlessly. Since I already love bacon, I was good to go. The bacon crisped up in about 18 minutes but I baked it for a couple additional just to make sure it was extra crisp. The crackers browned beautifully from the fat in the bacon and stayed extra crisp and crunchy. The flavor was interesting. Not as 'bacony' or 'salty' as I expected. But, surprisingly good. I admit that after about 6 little crackers, my stomach said; "enough already" but I have to be honest and say they really were not greasy on my fingers. Another surprise. As I removed the bacon crackers from the pan and put them on the serving plate I was asking myself if this was a recipe I would serve guests? My decision was this; I would make these as a quick snack if I were craving sweet, salty, crunchy and bacon all at the same time. I would make and serve these to my family... but I honestly don't think I'd put them on in a buffet for guests. It's a quick, easy and yummy snack but it's not the prettiest cracker, is it? My teenage daughter had a great suggestion; skip the brown sugar and add some grated cheddar cheese to them during the last few minutes of baking. YUM! This morning I looked through my files and saw this picture I forgot to post! A couple weeks ago my husband asked for burgers for dinner. A yummy mixture of burgers with just the right amount of spices and bits of shredded cheddar was prepared and then... I realized we were out of propane. No worries! Whenever we find ourselves out of propane, this is what I do! I grabbed a baking sheet, placed a metal wire cookie cooling rack on it and placed the burger patties on it. This allows the fat to drop away from the meat while cooking. I chose to place them under a broiler set on low, cooking both sides and then switching to 'high' for just a minute at the end to crisp and brown them. You can also bake your burgers this way at 400 - 450 degrees until done. If you've checked into my website very often, then you know I'm Mom, a wife, a woman who likes to cook and bake but I'm not into taking an hour to do a 'photo shoot' of the preparation or food. I've actually taken to keeping my cell phone next to me in the kitchen to 'remind' me to take a couple pictures... and more than likely I forget to take a picture of the finished product because I'm so busy setting the table, getting the food on the table and eating it! By the time I got our pets all taken care of and fed and then set the table, got the rest of the dinner ready and sat down to pray, I completely forgot to take a picture until it was gone. Oooops. So, it is what it is. Ha. It's how I roll. This is one of those recipes you really (really) don't need to measure or be precise and you can add or delete as you wish. Here is what I threw together at the last second because I had chicken breasts thawed and needing to be used up. Quick, simple and easy but it's rather impressive to serve. Rinse the chicken breasts. If they are thick or not uniform in thickness, pound them between pieces of wax paper or parchment to thin them a bit or make them even so they are easier to roll up. In a small bowl place the cream cheese. Microwave a few seconds to soften. Add the feta and chopped broccoli. Mix well. (When your broccoli is chopped well you don't need to pre-cook it. If you have larger pieces, you will need to soften them a bit by cooking a few minutes or they will be too crunchy). In another container or in a baggy, place about 3/4 cup flour, or use bread crumbs, panko crumbs, even a mixture of crushed rice krispies, regular corn flakes, flour, low carb breading... whatever you prefer). If you are using unseasoned breading or flour, then use salt and pepper to season a bit - about 1/8 t each. You can also add a little garlic or onion powder or even some Italian seasoning. I'd use about 1/8 t - 1/4 t dried seasoning. Lay out your chicken breast and scoop about a tablespoon or two (depending on the size of your chicken breast) into the center and roll up. Now roll in the breading mixture, pressing gently into the chicken to help adhere it. You shouldn't need an egg wash, if they moist, the coating will stick. Unless you have small chicken pieces, you shouldn't need to secure it, and it should stay rolled when placed seam side down into a baking pan you have added a bit of oil to, so they don't stick. If your chicken breasts are opening up, just secure them with 2 or 3 toothpicks. Lightly spray with Pam or another oil to help them brown to a pretty gold color while baking. When all four are ready, bake in a 350 degree preheated oven for about 45 minutes. When golden brown and the centers are no longer pink, serve hot. This might be as old school as you can get but I love it! You don't even really have to measure this one, you adapt it to your own preferences and for the dressing, do a taste test. There are a few people who do not add any sweetener to the mayonnaise in the dressing, but I'm not one of them. I think this salad is 'made' by two ingredients; the bacon and the dressing. And the dressing must have just a smidgen of sugar or sugar substitute to it. (I use Xylitol or splenda). This is a pretty layered salad so I like to serve it in a glass container (any shape - pan, bowl, it doesn't matter) but you can put it in any container you wish. I don't always add onions because many people don't care for them. But you can make this a 8 or 9 layer salad with the addition of onions and or green peppers added to the celery. This is one of the many times you can play with your food and not get in trouble. It will be delicious. In a container start with a layer of lettuce. Top with a layer of frozen peas. Add your optional celery, onions and green pepper if you wish to use them. Mix about a cup of mayonnaise with 1 tablespoon sugar or substitute. A dash of salt and pepper (not much!). Stir, let it sit about 3 minutes and do a tiny taste test. You won't want it 'too' sweet but just enough to cut the tang. If you've added too much sugar, just add another dollop of mayonnaise or even a little sour cream. The amount of dressing you use is up to you! I like a nice thick layer so I use about 1 1/2 cups for a 9X13" pan or a large bowl. Add this and spread with a rubber spatula. Top with your hard boiled eggs, bacon and cheese. Cover with plastic wrap and refrigerate for at least 5-6 hours if you can. Overnight is fine. Serve with almost anything. My childhood home always and forever had a supply of canned biscuits in the refrigerator. If a meal called for biscuits on the side, a can was popped open, little rounds of dough were quickly placed on a baking sheet and a few minutes later we were slathering butter on hot buns and eating them by the handfuls. The biscuits were also used by my mother to make donuts - simply push your finger through the center of each round, pulling to a circle donut shape and fry in hot oil. Drain on a paper towel and sprinkle with sugar while hot. By the time I was about 10 years old I was trying to be creative and would wrap small cubes of cheese in the hot dough and fry them in an attempt to make cheese balls, and one of my favorite comfort foods of the 80's was when my Mom would make a chicken and biscuit dish with the chicken and gravy layer on the bottom, topped with biscuits golden brown on the top. Refrigerated biscuits got a lot of use in my childhood. Oddly enough, canned biscuits have never been a staple in our home after I was married. I prefer to make our biscuits from scratch so if there is a dish I want to make that calls for them I purchase them. Same goes for the larger Grands style biscuits (which I make strawberry shortcakes out of sometimes) and crescent rolls, which I use as the base for our cold veggie square appetizer. This is a recipe I found years ago and put away in my draft files to make when I had crescent rolls on hand. I completely forgot about it until I went through some of my old recipes this morning. Sure enough I have bacon and avocado on hand... but no canned crescent rolls. I could make this with bread but the flaky layers of crescent roll with this recipe is making my mouth water just thinking about it. I'm taking it out of draft files and posting it as a reminder to myself to pick up some crescent rolls and give life to this recipe. Divide crescent rolls into 4 squares (keep 2 of the triangles together). Press seams together on each of the four squares. Then cut each of the squares in half creating 8 smaller squares. Pour a small amount of olive oil onto your griddle and heat. When griddle is hot place all 8 squares on pan and cook for 3-4 minutes on medium-high heat. Flip squares over and place cheese on each square and then top 4 of the squares with 2 slices of bacon and 1/2 of an avocado each. Cook another 3-4 minutes. When cheese is slightly melted place the cheese only square, cheese side down, on top of bacon and avocado square. Flip. 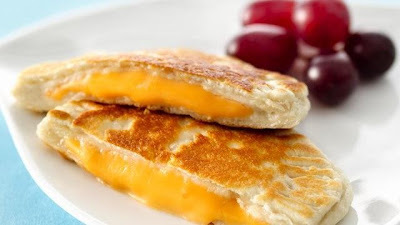 Cook until golden brown and cheese is fully melted. I could say I whipped these up last night in honor of the first day of school for our household (Monday) or I could even say it's to celebrate the hint of chill in the air signaling the arrival of Autumn soon... but let's be honest, shall we? I whipped these up for no reason at all. "Just because". You can use any white cake you wish - even use my low carb, sugar free white cake recipe here on the site (just use the search to the right, it's easy to find) - You can even a packaged mix if that is more your style - but hey, why not just whip up some cupcakes today? They are the quickest, easiest sweet snack to make and take almost no time at all. My version is a homemade cupcake and I opted for a marshmallow frosting over buttercream. I normally only make this marshmallow frosting for chocolate cake (it's the best!) but I wasn't in the mood to use butter, so 7 minute frosting (marshmallow frosting) it was! Mix the flour, baking powder and salt together in a bowl and set aside. Cream the butter and sugar. Add the eggs one at a time. Add 1/3 the dry mix, then 1/2 the milk, 1/3 more of dry mix, the last half of the milk and finally, the rest of the dry mix. Pour into 12 cupcake tins lined with your favorite cupcake liners. Bake at 350 until the centers done and a knife inserted comes out clean. If you have a double boiler, use it. For those that don't, use a pan with 2 inches water in it, on the stove. Use a metal bowl or second pan that just fits in it with the bottom touching the water but sits on the top of the saucepan. I have a metal bowl that fits in a Wolfgang puck saucepan perfectly so I use that. When the water comes to a simmer over high heat, turn it down to medium and place all in the bowl of ingredients on top. Using an electric mixer, beat in the bowl, over simmering or slow boiling water below it to 'cook' while you beat. It should take about 4-7 minutes to come a thick, stiff peak icing. Use to frost a single 9" cake or 12 cupcakes. Our family loves salsa and guacamole, but not 'store bought'. Once you make salsa from scratch, you never want to go back to store bought again. The jarred version has a different flavor to it that is 'dead' (first word that came to mind) as compared to the taste-burst you get from homemade. I make 3 or 4 different versions - which I've posted before. My long term, fall harvest homemade salsa is the canned salsa recipe on my site I have yet to find another I like better. I've been making this one since.... oh goodness... we lived in Brainerd, MN when I started making this version so it's been a family favorite, must make, stand-by since 2000 or so. Then I have the really quick version that is basically a "I'm starving and need salsa and chips right now" so you mix tomatoes with onion, add a dash of salt and lime and call it good. A really simple and quick version of a throw-together salsa I like and would recommend to anyone is this one; this one but now, let's move ahead to the one that is our family's number one favorite salsa recipe. I always tell people I use recipes for brainstorming and basic guide, but always, always, always "play with your food!" and salsa is one you can certainly do so easily. For this recipe feel free to use fresh or canned, diced tomatoes interchangeably. Fresh tastes best, but diced is excellent too. Play around with how hot you want your salsa but do start with just a bit of pepper (chili, green, jalapeno, etc.) no matter what. Even just a smidgen... it won't be 'hot' at all but will impart an important flavor. Build on the hotness factor as you and your family like. I don't personally like the smell or taste of cilantro (and it seems to close up my throat) so I just use fresh parsley. See? Play with it! This makes just a touch over a quart. Enough to fill a quart jar for the refrigerator and a little extra left over to enjoy immediately. Place everything in a blender or food processor and process by pulsing just until blended. Longer for smooth and shorter for more coarse texture. Taste... adjust accordingly with pepper, salt, lime, etc. Serve with tortilla chips. I store in a quart jar in the refrigerator. I like it not too smooth and not too chunky. Juuuuust right. SOUP! Ok, so it's the beginning of August and it's still just a little to hot to crave a couple of these... but then again, soup is good any time of year. We had Spicy White Hot Texas Chili this week.... and even though it was 90 degrees outside that day, it was nice and cool in the house and this soup with whole wheat rolls hit the spot just right. Here are a few of the soups I've posted on An American Housewife over the years. In one, easy to see list. Do any sound good for dinner tonight?